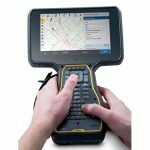 SUNNYVALE, Calif., Aug. 6, 2018 – Trimble (NASDAQ: TRMB) announced today that its Trimble RTX™ GNSS corrections technology can now achieve horizontal accuracies of better than two centimeters. Start-up times, commonly referred to as convergence, have also improved. Users can now achieve full accuracy in less than 15 minutes, and as fast as one minute in select areas where RTX Fast network infrastructure is available. This performance is achievable using Trimble’s premier correction service, CenterPoint® RTX, delivering RTK-level accuracy outside traditional Virtual Reference Station (VRS) networks, considered the gold standard for high-accuracy corrections. Trimble RTX provides unprecedented performance from a satellite-delivered correction source. In addition, corrections are available via an Internet or cellular connection, making it one of the most versatile services available today. Offering a suite of correction services, Trimble RTX provides users the flexibility to choose the level of accuracy to suit their application needs from meter to centimeter level. It is an ideal correction solution for a variety of applications including agriculture, survey, mapping, construction, automotive and any location-based service that could benefit from greater precision. Trimble RTX also powers Trimble xFill® technology, a feature that enables RTK and VRS users to continue working if their primary correction stream is not available. xFill, delivered via satellite, “fills in” for RTK corrections in the event of temporary radio or Internet connection outages. As a result, users can experience fewer interruptions and less downtime. Trimble RTX technology utilizes data from a global reference station network to compute high accuracy positions based on satellite orbit and clock information. Trimble RTX supports a suite of real-time correction services delivering a range of accuracies from better than 2 centimeter to sub-meter performance in as fast as one minute. Trimble RTX-based positioning innovations are available via convenient, easy to access satellite delivery or via IP/cellular communication, providing users with flexible options to obtain high-accuracy positions in nearly any work environment. Trimble RTX correction services are available throughout most of the world.